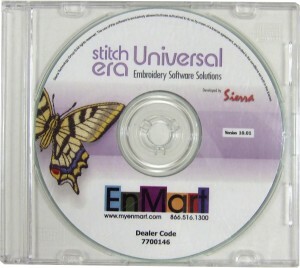 Free Digitizing Software from EnMart » Embroidery Talk Has Moved! Digitizing is something that a lot of machine embroiderers would probably like to do, but weren’t sure they would ever be able to do. For some, the cost of the digitizing software is prohibitive. For others, the complexity of using the software seems daunting. Some people just don’t care to digitize at all, and so hire expert digitizers to do the work for them. If you’re in the last category, the new software EnMart has to offer probably won’t be of interest. Everyone else, however, could benefit from ordering a copy of EnMart’s new offering, Stitch Era Universal Free Digitizing Software. The Stitch Era Universal software is the first advanced software for the creation of embroidery designs that is free to end users. It includes a large number of features, and performs all the functions necessary for digitizing including format conversion, pre-digitized letters, letters from true type fonts, advanced stitch editing, auto-digitizing, conventional digitizing, interactive digitizing and many more. At a cost of $4.95, which covers shipping, handling and the creation of the CD, the software is free to end users. EnMart has also made a special offer, which allows buyers who purchase $30 worth of thread from our Thread and Thread Related category to use the code SEU2010 to get the software for free. Stitch Era Universal is compatible with many major embroidery machines. You can find a complete list of machines on which the software works on the Sierra web site. The software also works with Windows. The recommended and minimum configurations for your computer are available on the Stitch Era website. Best of all, buying one copy of the software gives you the license to load it on to multiple computers, so you can use the software in your shop, on the road or in your home. This entry was posted on Thursday, February 11th, 2010 at 12:12 pm and is filed under Machine Embroidery Supplies. You can follow any responses to this entry through the RSS 2.0 feed. Both comments and pings are currently closed. You can order the software off our website. Just visit http://www.myenmart.com and click on the software menu item. Hi Joyce. We don’t sell this software anymore, but you can find more information about it on their website. According to the information there, it does work with Windows 7. Hi, I downloaded this software before from EnMart. I would like to install it in another machine but I have forgotten the download code. Do you still have the download code? Hi Emily, I don’t have the download code readily available, and the person who might have it is out of the office until Wednesday. I’ll check with him when he gets back, but until then, you might try visiting the Stitch Era Universal Yahoo Group. They might be able to help. I have used this software and still no problem. It helps a lot.